Ideal for precision erasing, Faber-Castell Perfection Eraser Pencils are ideal for erasing a variety of media. 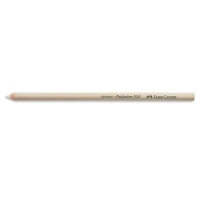 Every Perfection Eraser Pencil is latex-free, with an eraser core encased in a wood barrel. The pencils can be sharpened in a standard pencil sharpener. Eraser Pencil — Contains a hard, white eraser for precise erasing of ink, India ink, and ballpoint pen. Eraser Pencil with Brush — Contains a hard, white eraser for precise erasing of ink, India ink, and ballpoint pen. A brush on the opposite end sweeps away eraser residue. Eraser Pencil, Pkg of 2 — Pencils contain soft, red erasers for fine point erasing of graphite.